Soma is a small family-run farm set within the diverse agricultural community of the Okanagan Valley. The property includes a working Craft Cidery, Orchard, and Alpaca farm—a synergy that highlights the wide range of farming, cultivation, and production practices throughout British Columbia. Arrange a tour, or simply drop by Soma Cidery to visit our Tasting Room and Ciderhouse Lounge. Our farm is a place for conversation, new friends, and sampling exceptional ciders. We look forward to meeting you. Join us in the Tasting Room for a special selection of ciders only available on site. Try a sample flight, chat with us about our process, and pick up some bottles for home. 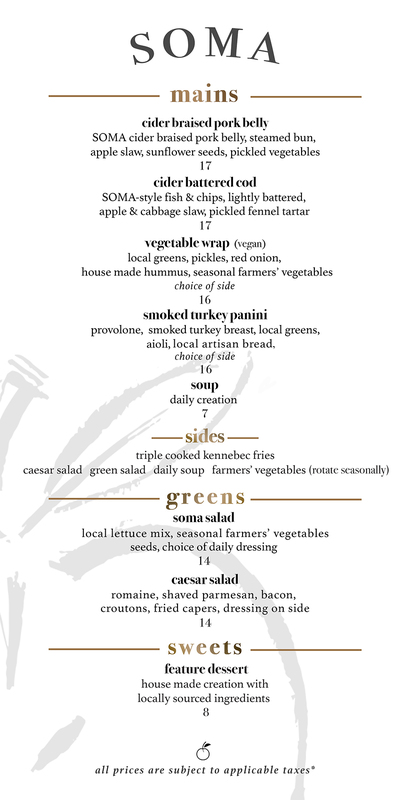 Come enjoy our casual menu featuring local ingredients. Sit inside in the cool of our great room or grab a seat outside and enjoy the afternoon sun. Surround yourself with contemporary design while enjoying a traditional Farm Inn experience for your corporate or private function. We are located on 13 acres of pristine farmland situated amid the rolling hills, vineyards, and pine forests of the Okanagan Valley.